FOR more than four years one of the conservation area’s most distinctive buildings has been shrouded in scaffolding. Now the scaffolding is coming down revealing the imposing facade of the Alex’s main building, one of the most striking features of the conservation area. The building is now being converted into luxury flats. The new owners are due to start moving in early in the new year. The old Royal Alexandra Children’s Hospital finally closed its doors in 2007. For more than two years the future of the building hung in the balance. Initially the developers wanted to clear the whole site. This meant demolishing the much-loved main hospital building, which dates from 1880 and was designed by the noted local architect Thomas Lainson. But the MCHA fought tenaciously to save the building, persuading the planning committee to reject the demolition plans—against the recommendation of the planning officers, who were happy to see the building demolished. Then squatters moved in. The MCHA went and talked to the squatters, explaining the building’s heritage. They too came to respect the old building and promised they wouldn’t damage it. They also gave us a conducted tour. But it was a risky episode. The membership of squats is anarchic and there could be no guarantee that a rogue squatter wouldn’t set the place on fire. The turning point came at the public inquiry in May 2009. Taylor Wimpey had appealed against the planning committee’s refusal to allow demolition of the old building. The inspector turned down the appeal, praising the architectural quality of the main building and the two cupolas, which he said were “a major feature of the skyline”. After a few more months of wrangling we met David Brown, who was then in charge of the Alex site and who is now managing director of Taylor Wimpey southern counties. He told us that there had been “a sea change” in Taylor Wimpey’s thinking. The company was no longer wedded to demolition of every building on the site and it was now keen to explore ways of keeping the main building. In October 2010 Taylor Wimpey produced a new plan for the Alex. This time it was a plan that the MCHA could support because it kept the iconic main hospital building. In this plan there were 20 flats in the main building and a further 101 new build flats on the rest of the site. Taylor Wimpey dropped its demolition plans and the MCHA spoke in favour of the conversion plan at the planning committee. The committee voted unanimously to approve the conversion plans and the Alex was finally saved. The main feature of the new plan was to restore the building to the way it looked around the outbreak of the First World War. The main building had been altered several times over the years. The most successful alteration was the addition in 1906 of two-storey open-air balconies on the facade for the treatment of TB patients. These were designed by the noted local architects Charles Clayton and Ernest Black. The later alterations were more problematic. 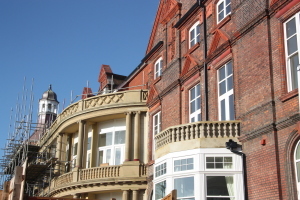 An extension of the main building along Dyke Road in 1927-8 was a sensitive addition to the main building, but glazing the balconies and adding a roof to the third floor balconies was a bit of a bodge, and criticised by the inspector in his report. Even worse was the replacement by the NHS of timber windows by UPVC. The restoration has reversed many of the more damaging alterations. 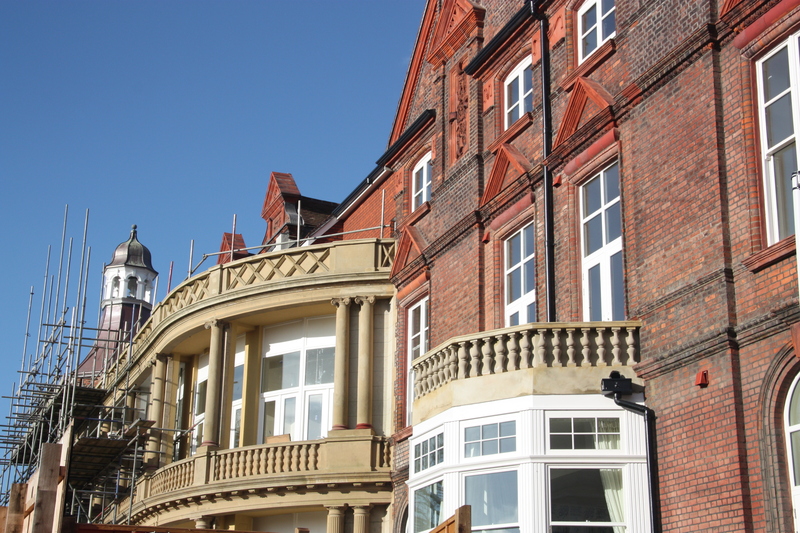 The UPVC has been replaced with timber and the incongruous top of the TB balconies has been demolished as has the extension of the main building on Dyke Road. In 2011 Taylor Wimpey built a temporary marketing suite and a couple of show flats on the triangular green space in front of the main building, to help sell the flats in Royal Alexandra Quarter, as the development is now called. The marketing suite, which only had planning permission for three years has now been removed and the green space will shortly be restored. The marketing suite for the flats is now on the right hand side of the entrance hall to Lainson House, as the main hospital building is now named in homage to the architect who built it. The entrance hall—which was also the entrance to the old hospital—sports an impressive tiled floor, which was laid by hand. The cornice around the entrance hall has dentil moulding, copied from a wooden moulding above the main doorway. The show flat is on the left of the entrance hall and has a splendidly large and elegant living room with french doors leading out of a bay onto the green lawn in front of the building. The building’s history is now one of its main selling points. The advertising outside the entrance to Lainson House proclaims: “A place in history. Your place for the future.” The value of the heritage is reflected in the prices for the flats in the conversion, which range from £400,00 for a one-bedroom apartment up to £675,000 for the show flat.